I jumped up and down to see what else was to discover. We are so excited about this year's Christmas planner! It includes a cover made just like our black and pink stripe planner we did a few months ago. 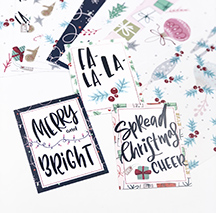 The FA LA LA Christmas Bundle also includes 4 inserts for all your Christmas planning needs: shopping and sales, holiday planning, dot grid, and lists galore. 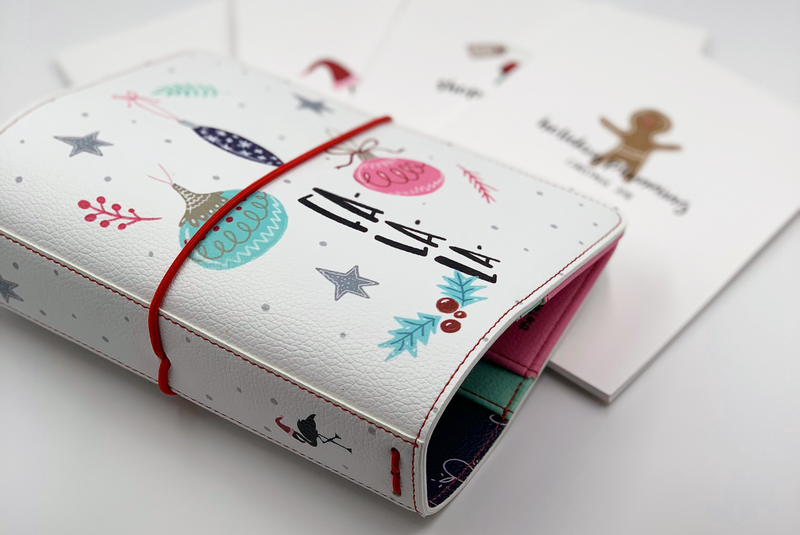 The accessories start with 8 sheets of paper and end with a charm. Okay, I will not skip the middle... you also get 2 rolls of washi tape, 3 metal paper clips, 3 journal cards (each featuring the quote from each of our Christmas planners), 10 die cuts, a sheet of vellum, a plastic dash sleeve, and sticky notes. That is not all! I have to thank each of these wonderful shops for working with me to complete this years kit: Eclectically Emily who made the sticker sheets, StudioL2e brings us an amazing set of stamps, Sew Silly Baby probably wished she had elves to help sew up the fabric pocket folders, and last but certainly not least, PenGems who printed our Fa La La pattern on their ballerina pen which is like the cherry on top of this bundle. Now, washi! Now, charm! Now paper and vellum! On, pen! On, stamps! On, cover and inserts! To the hands of these planners! To the girls that will create! Now dashboard you make! Dashboard you make! Dashboards for all!